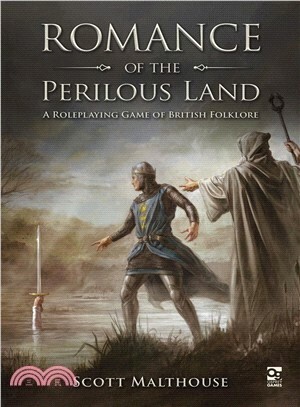 Romance of the Perilous Land is a roleplaying game of magic and adventure set in the world of British folklore, from the stories of King Arthur to the wonderful regional tales told through this green and pleasant land. It is a world of romantic chivalry, but also of great danger, with ambitious kings, evil knights, and thieving brigands terrorising the land, while greedy giants, malevolent sorcerers, and water-dwelling knuckers lurk in the shadows. As valiant knights, mighty barbarians, subtle cunning folk, and more, the players are heroes, roaming the land to fight evil, right wrongs, and create their own legends. Scott Malthouse is a roleplaying game designer and folklore enthusiast who was born and bred in Yorkshire, where he currently lives. His work includes the award-winning Quill (Best Free Game 2016, Indie RPG Awards), In Darkest Warrens, and Unbelievably Simple Roleplaying. John McCambridge is a versatile artist, having worked a long time as a concept artist for video games such as Bulletstorm, Runescape, and Saga, Rage of Vikings. More recently he has worked on books and board games, including Elysium, T.I.M.E. Stories, and the illustrated edition of Game of Thrones. He lives in the Fens with his wonderful wife and son.